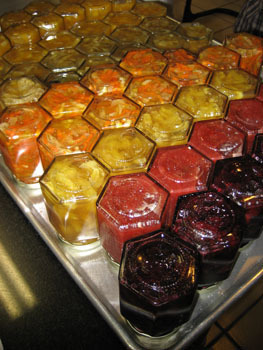 Farmers markets around the country are screaming with color right now and magazines are full of recipes for preserving. But many habitues of these markets demur at the prospect of making their own fruit preserves. It may be the 10-quart pot of boiling water or the terrifying images of spoilage indelibly imprinted by home economics teachers that leave serious cooks and local food proponents content to try elk and goat but too timid to try jam-making. If professional training in French pastry-making taught me one thing beyond candy-making, it certainly de-mystified and simplified preserving. Market devotees deserve to know they've been unnecessarily intimidated. The techniques I learned from pastry chef Christine Ferber, France's queen of confitures, and from my chefs at the French Pastry School, have almost nothing in common but fruit and sugar with what I had learned in the past. These guys have had some pretty sensitive jobs -- like working for the French president and the Sultan of Brunei -- so I am confident that this is not casual advice. In this time of seasonal bounty, it seems unfair not to share what I learned and debunk a few myths. Most cookbooks will tell you to wash your jam jars in soapy water and then submerge them in a large pot of boiling water for about 15 minutes to sterilize them. Get rid of the pot! There's no need to cap a glorious day at the market with a steamy day in the kitchen. Clean jars can be effectively sterilized by placing them on a clean cookie sheet in a 350 degree oven for 10 minutes. That's enough time to kill bacteria and provide a sanitary receptacle for your fruit jam. Jars should be filled to within an 1/8 of an inch of the top, according to most recipes. Think about it. This makes no sense at all! Fill the jars as full as you can. That's what Ferber, who turns out over a million dollars of hand-filled jars a year, does in her small Alsatian kitchen. Less space will leave less room for funky things to grow. You just need to make sure the outer rim of the jar is clean so that the lid will seal tightly. As soon as you fill the jar, seal it. Don't leave a jar open while you fill others and then seal them all together at the end. Maybe, but sugar helps preserve fruit. Reduce the sugar, but know that you may also be cutting the preserving power. As a guide, consider that in France, by law, preserves need to consist of roughly 60 percent solids after cooking. If standing over a large hot pot to sterilize empty jars is not enough of a nuisance, conventional wisdom says you also need to boil the filled jars to create a tight seal. Not true! All you need to do is turn the filled jars, while they are still hot, upside down on a wire rack or sheetpan. Then let them cool completely. When you turn them right-side-up, check the vacuum by giving a gentle push with your thumb in the center of the lid. If you have sealed the jars properly, you will not be able to depress the lid further as you will have already created a vacuum. However, if you have not sealed the jars well, you will hear a slight click and feel a slight depression. You can still forget about the terrifying lessons of your home economics teacher, but I'd stick the preserves in the fridge. Once any preserves are opened, even those that have been sealed properly, they always belong in the refrigerator.